Alley Kat's Neil Herbst, beer expert and amateur history nerd Jason Foster and Shane Groendahl of Edmonton Beer Geeks Anonymous. The love child of ECAMP, Beer Geeks Anonymous and beer aficionado Jason Foster, our BrewCurious tour has been fermenting for nearly a year. In the midst of its planning, somebody posed a curious question: “What if someone could make a special edition brew using a historically inspired recipe?” After a flurry of emails back and forth, Neil Herbst of Alley Kat found himself intrigued at the prospect and committed to the project. Jason should know. He’s a local beer writer and educator. In addition to being the beer columnist on CBC Radio One’s RadioActive and for Vue Weekly Magazine, Jason is the creator of onbeer.org, a website devoted to craft beer on the prairies. He writes for a variety of publications around the country and hosts beer tastings, beer dinners and educational events. He is a longtime award-winning homebrewer and a Certified Beer Judge. Jason is also an amateur social historian. So, yeah, Girder Bender’s got street cred. The date was set to start the heritage brew. Shane Groendahl, home brewer and member of Edmonton Beer Geeks Anonymous, showed up to lend a hand. ECAMP was taken through Brewing 101. The barley had been roasted on Jason’s various grills (which answers the question “Can a Big Green Egg be used to get a dark roast?”) and was heated in a pot to release the sugars from the barley this grain stew is called the MASH. 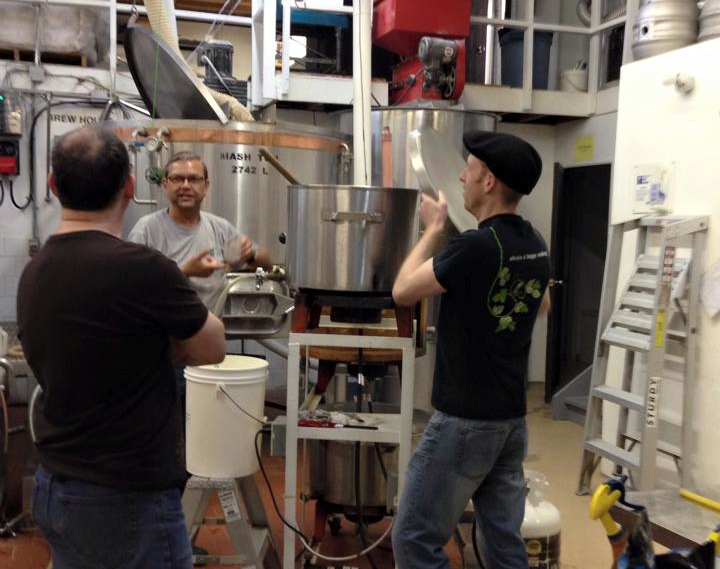 Neil Herbst and Jason Foster brewing a special ECAMP edition brew. The water and barley steep with repeated checks on the sugar content, as higher sugar content means higher alcohol content in the end product. Based on Neil’s final readings, the Girder Bender should be around 6%. Once happy with the sugar content, the wort (steeped barley water) was poured off leaving the spent grains in the Mash tun (pot). Spurging is the process of rinsing the mash with hot water allowing the water to pull as much flavour and sugar out of the grain and transferring it to the copper boil kettle. Sparging: pouring off the wort (sugared water) after boiling the malted barley. Transfering the wort to a copper kettle to boil. Hops are added for flavour at this time. watching a kettle boil for 90 minutes. The copper helps evenly heat the wort and this kettle is direct fired (i.e., burner underneath the pot)—which made for many propane fuelled pops when lighting it. Boiling allows flavours to be enhanced, sterilizes the wort and condenses the sugar. After the particles are filtered out and the wort is cooled, yeast is added to start the fermentation process. Then we wait. At last report from Neil at Alley Kat the Girder Bender is a happy place for yeast to feed, breath and breed. We can’t wait to taste it.